A cup, a cup, a cup, a cup, a cup...ahhh! Memes are perfect for coffee hour - a creamy café au lait, a crisp wedge of biscotti, and just enough time for a quick chat full of extraneous information. Like a valentine from a crush in my glorified kindergarten shoebox, I got tagged for the 5 Things Meme by Helios over at Tales from a Veggie Kitchen. So now, without further ado, the 5 Things Meme...and a recipe for some delicious Pistachio Biscotti. Burt's Bees lip shimmer in "nutmeg"
In a large bowl, whisk together the flour, sugar, baking powder, salt, and cinnamon. Stir in pistachios and set aside. In a small bowl, whisk together the eggs, honey, olive oil, and zest. Use a fork to stir the egg mixture into the dry ingredients, stirring until the dough clumps together. Turn the dough out onto a lightly floured work surface and press the dough together. Divide in half. With lightly floured hands, gently shape each half into a log 13-14 inches long. Carefully transfer the logs to the prepared baking sheet, placing them at least 3 inches apart. Bake for 25-30 minutes, until logs are well risen and firm. Set the baking sheet on a wire rack and cool the logs completely. Reduce the oven temperature to 325 degrees. Peel away the parchment paper and transfer the logs to a cutting surface. Using a serrated knife, cut the logs on the diagonal into half-inch slices. Line the baking sheet with clean parchment paper and place the biscotti, standing up, on the baking sheet. Bake for 10 to 15 minutes, until dry. Set the baking sheet on a wire rack and allow to cool completely. This recipe is brought to you from The Good Cookie by Tish Boyle. For more of Ms. Boyle's beautiful recipes incarnate, visit Ivonne at Creampuffs in Venice; she introduced me to this marvelous cookbook. 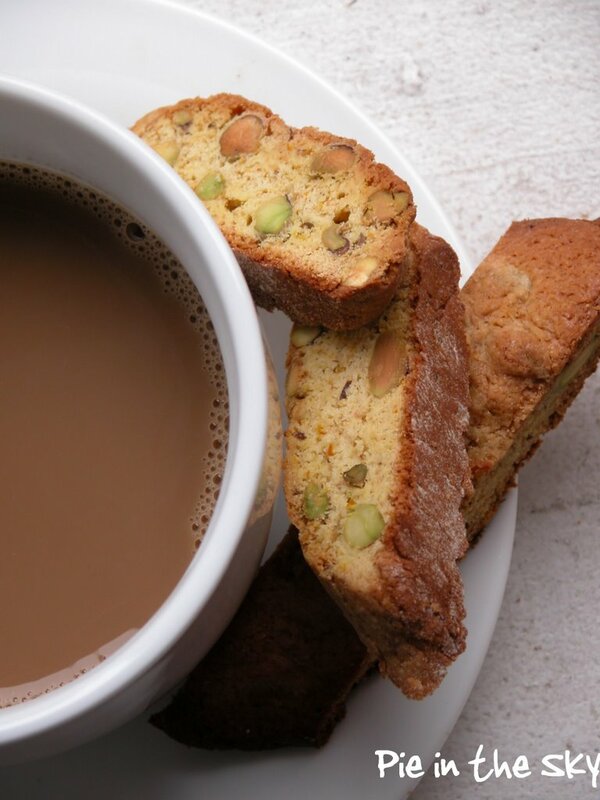 Ahh, biscotti, I do love you with coffee. I do try to limit my biscotti making to Christmas time but gosh blogging is changing my world. Beautiful. Yay! Thanks for playing! And I agree, the Good Cookie is a great cookbook. Did you know she just came out with a cake cookbook? I'm trying to resist.....but it might be futile. my armenian heart be still with this pistachio biscotti! i am now craving it with my soorj (armenian coffee, which is just like greek coffee - strong, sludgey, and super).Thank you for the recipe, Kate! So what do you think the chances are of another person having all things Barbara Kingsolver, nutmeg shimmer Burt's Bees, and Blackberry Cabernet Sorbet stashed in all the same places? Are we related? I have a crazy fancy dress I bought on sale and never wore too, but I recently gave it to my little sister, hoping she'd find an occasion to wear it. 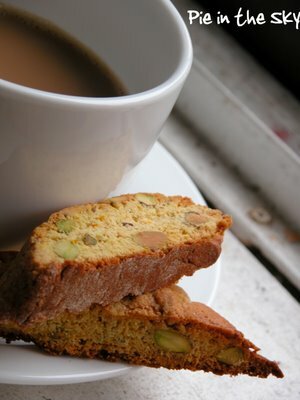 tanna - my vote is, biscotti whenever it's cool enough (in an air-conditioned room, even) to contemplate a hot cup of coffee. yay! helios - cake book?!?! aw man. i must have it. amy - you know what i want it with? a big mug of this chai from the kitchen (apartment therapy): http://kitchen.apartmenttherapy.com/food/beverage/recipe-iced-chai-010487. But your armenian coffee sounds delicious, too! Great post! :) Love you! Ah biscotti. I take mine with tea. I make mine with almonds, lemon zest and fennel seeds. and over the holidays cranberry and orange zest.